The Esri User Conference (Esri UC) is your oyster. Cool geospatial technology comes together in one place, making the weeklong experience exhilarating. But getting to every technical session, demo, and exhibit on your wish list can be daunting. So we suggest you do some advance planning and check out the ArcWatch Guide to the Esri UC for conference highlights and tips on what to see and where to eat in San Diego. The guide was created using an Esri Story Map Journal app. View the Story Map Journal. 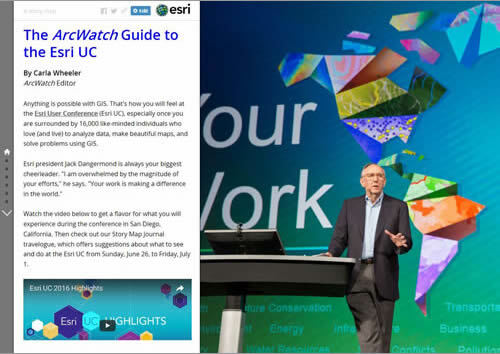 This Story Map Journal serves as a handy guide to Esri UC happenings. Esri Demographics can add valuable context to your GIS analyses. Just use the Enrich Layer tool in ArcGIS Online, which adds demographics to any map. Read the tip. Salt Lake County, Utah, created a useful online interactive map that helps senior citizens and others at risk for heat-related illnesses find air-conditioned facilities, called Cool Zones, in their neighborhoods. Read the article. DNV GL, based in Norway, has launched The Arctic Risk Map, an online app that contains a wealth of information about oil and gas activities, shipping routes, ice conditions, and wildlife. Read the article. Esri's Jeremiah Lindemann created the story map Celebrating Lost Loved Ones to honor his brother and other people who have lost their lives to the prescription drug and heroin epidemic. Read the article. Gary Knell, president and chief executive officer of the National Geographic Society, outlines his organization's partnership with Esri on the Great American Landscape project, which will include a national green infrastructure map. Watch the video. Browse through this collection of maps called Policy, Maps, and You, which includes demographic information that can help both governmental and nongovernmental organizations shape public policy. View the maps. Dave MacLean from the Centre of Geographic Sciences (COGS) in Canada created this Esri Story Map Tour app that maps photographs that Russian cosmonaut Sergey Ryazanskiy shot and then Tweeted from the International Space Station. View the Story Map Tour. Geography teacher Dennis Hunink of the Netherlands uses Esri's ArcGIS Online and the Collector for ArcGIS app to help his students master subjects such as topography. And he's passing on his knowledge of GIS to fellow teachers. Read the article in GeoInformatics. Consumer drones are fun to fly as a hobby, but these newfangled flying machines can also be productive at work, especially when teamed with Esri's new Drone2Map for ArcGIS. The new desktop app takes geolocated photos shot by the drones and turns them into professional imagery products that can be visualized and analyzed in ArcGIS. Read the blog. Get Drone2Map for ArcGIS. Bring a sample of your data to the 2016 Esri UC for a free data health checkup. 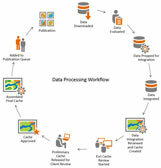 Esri staff will diagnose problems or give your data a clean bill of health. Sign up today for an appointment. Want to add pictures in pop-ups or use photographs of logos as symbols on your map? 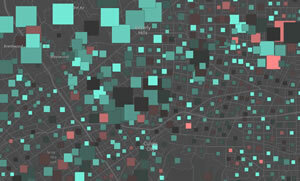 Esri's Nuno Ricardo shows you how, using ArcGIS Online. Read his tip. Esri offers two-day instructor-led courses that teach GIS professionals how to get started using ArcGIS Pro. Learn more and register today. Identify national park landmarks in the United States using this quiz, embedded into The National Park Bird's-Eye Quiz Esri Story Map Journal. Take the quiz. You asked, and Esri answered. Contributors to the Esri Community Maps Program can now easily see where their data contributions are in the data processing workflow and get an estimated publish date. Learn more. Esri offers ArcGIS for Desktop/ArcGIS Pro software bundled with Dell and HP hardware that can complement or upgrade your GIS infrastructure. Order today. Making the Most of a "Digital Earth"
Esri chief scientist Dawn Wright says that innovative digital technologies are shedding new light on changes happening to the earth. Sharing workflows and use cases, telling compelling stories, and building public-private partnerships will make these technologies, including digital data collection, analysis, and visualization tools, even more useful. Read Wright's article at DataDrivenJournalism.net. The United States Geological Survey (USGS) is transforming complex scientific findings into interesting stories using Esri Story Map apps. One example was a story map on the dangers posed to people by low-head dams and what is being done to reduce the hazard. "You can get the story behind the science," says Gary Latzke from the USGS. Watch the video.